This article is 2646 days old. Life ain’t easy for a team named Soo. The Windsor Spitfires continued their momentum from Friday night’s win in Sarnia, taking advantage of a struggling squad this afternoon, and dominating for the most part as they defeated the Sault Ste. Marie Greyhounds 3-2 at the WFCU Centre, in front of a crowd of 6348. The first period had begun with over five minutes of hockey action, without a stoppage. Quick passes and great puck movement set the pace for both teams early in the game. Sault Ste. Marie started the period with 8 shots before allowing Windsor one of their own. Despite the shot deficit, the Spits offense got on the board first as Zack MacQueen rushed into the Soo zone. He passed it forward to a speeding Kerby Rychel, who then dropped it back to Brady Vail. He made no mistake of shooting it passed Soo goalie Jack Campbell. Just over five minutes later, Rychel got himself another point, this time a goal. 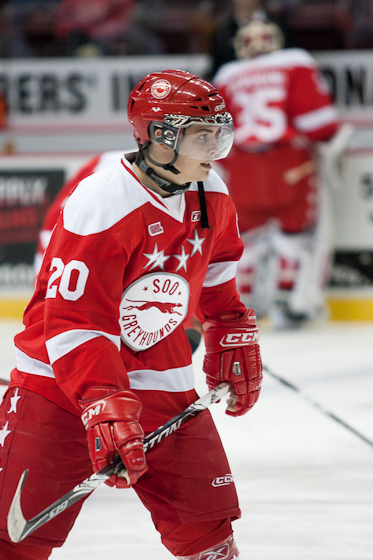 Alexander Khokhlachev crossed the Soo blue line and quickly worked his magic. After passing the puck, he got it back as he circled the net. He sent it out front to teammate Nick Czinder, who found Rychel on the side of the net. Rychel kicked the puck to his stick and shot into the net, closing out the scoring for the period and leading 2-0. In the second period, Sault Ste. Marie was able to tie things up. The Greyhounds had great powerplay passing plays, and as a result, Gianluca Curcuruto let a wrist shot go that beat everyone, including Spits goalie Jaroslav Pavelka. A little over a minute later, Greyhounds defenseman Joe Rogalski let a soft shot go from the point that also beat Pavelka. Just like that, the game was tied at 2. However, nearing the end of the second period, Jordan Maletta and the Spitfires kept pushing forward. Along the boards, Ben Johnson backhanded a pass to Michael Clarke beside the net. His pass met Maletta’s stick and the puck crossed the line as the Spits now led 3-2 after two periods. Sault Ste. Marie put itself in more trouble as, before the second period had ended, Rogalski received a 4-minute major penalty for checking Clarke from behind. Towards the end of Rogalski’s penalty, the Greyhounds took another, which gave the Spitfires a 5-on-3 opportunity. The powerplays were unsuccessful though. Both teams each had a few more chances, but the final buzzer sounded and the Windsor Spitfires earned 2 important points, as they were victorious over the Sault Ste. Marie Greyhounds 3-2. The Spitfires’ next home game is this Thursday, January 26th against the Saginaw Spirit.